Library Hat is a blog written by Bohyun Kim, Chief Technology Officer and Associate Professor at University of Rhode Island Libraries. Formerly, she was Associate Director for Library Applications and Knowledge Systems at University of Maryland, Baltimore, Health Sciences and Human Services Library and one of the four founding librarians of the Florida International University Medical Library that opened in 2009. She is the author of two books, The Library Mobile Experience: Practices and User Expectations (ALA TechSource, 2013), and Understanding Gamification (ALA TechSource, 2015). She has published many articles and given numerous invited/peer-reviewed presentations on a variety of topics related to library technologies and their impact on libraries. She was invited to the Expert Panel for the 2017 NMC Horizon Report (library edition), currently serves on both the Advisory Committee for the Office for Information Technology Policy (OITP) of ALA (American Library Association) and the Advisory Group for the ALA Center for the Future of Libraries, and is the President-Elect/President for Library and Information Technology Association (LITA) for 2017 – 2019. She was an invited panelist for the “Top Technology Trends” program at the ALA Annual Conference in 2014 and is also the founding editor of Association of College & Research Libraries (ACRL) TechConnect Blog. She is the Vice President/President-Elect of LITA, was a 2011 ALA Emerging Leader, and served as the Outreach Director of New Members Round Table (NMRT) for 2012 – 2014 and a Director of the LITA Board from 2014 to 2017. 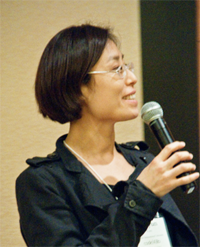 She graduated from Seoul National University in South Korea and holds a Master’s degree in philosophy from Harvard University and another Master’s degree in library and information science from Simmons College. She regularly tweets at @bohyunkim, and less frequently writes in this blog.